ASUS constantly strives to help users fine-tune their hardware. But it’s not enough to just provide access to extensive configuration options—making adjustments needs to be as easy as possible. That’s why we developed DisplayWidget, a new software utility that lets you take command of select Adaptive-Sync monitors from the Windows desktop. You can tweak the display properties with a click or let the software make changes automatically based on application-specific preferences. Seeing the best picture has never been simpler. DisplayWidget uses the Data Display Channel Command Interface, otherwise known as DDC/CI, to issue commands over DisplayPort and HDMI. It works with our new MG28UQ, MG24UQ, and MG248Q gaming monitors and will also be compatible with future MG-series displays. In PC DIY Labs, we’ve been using DisplayWidget on the MG24UQ, which squeezes a razor-sharp 4K resolution into a compact 24” screen. At 187 PPI, the resulting pixel density depicts finer details than any other ASUS display. The 8-bit IPS panel produces vivid colors that look great from every angle, while Adaptive-Sync technology ensures smooth gameplay, a vitally important feature for 4K. 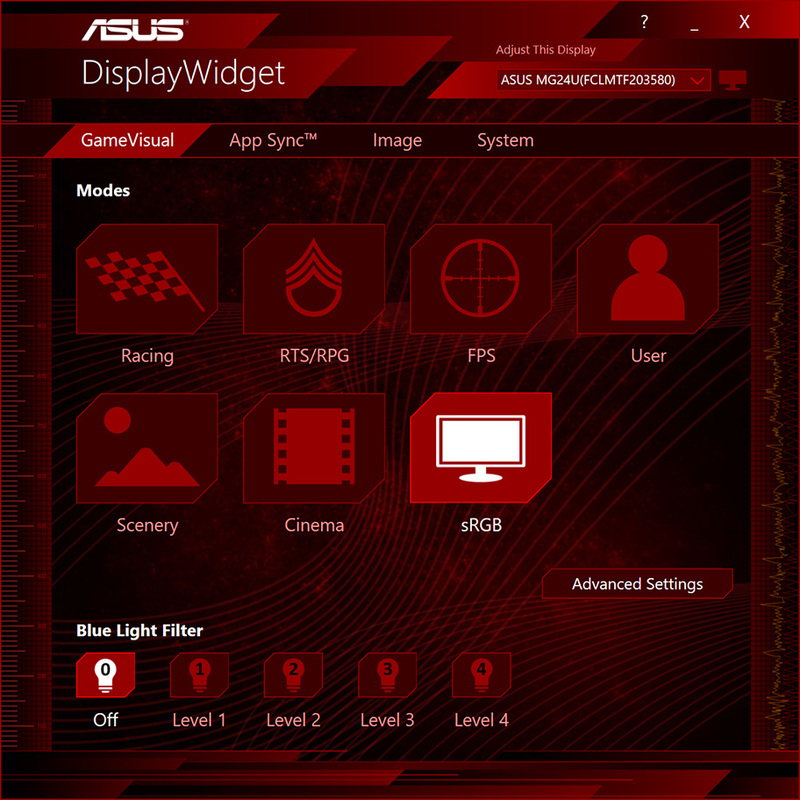 Like other ASUS gaming monitors, the MG24UQ has multiple GameVisual modes that tune the picture for different activities. FPS mode brightens shadows to help gamers spot hidden enemies, RTS/RPG mode displays scenes with lusher colors and sharper details, and Racing mode offers the best visibility when driving at speed. Scenery mode makes grass greener and skies bluer, which is ideal for picture slide shows, while Cinema mode cools and saturates the colors to draw you deeper into movies. There’s also a neutral sRGB mode that’s perfect for web surfing and photo editing. Each mode has a selection of customization options, a full assortment of which is available in an additional User mode that lets you tweak to your heart’s content. Customizing these modes and switching between them is typically done with the monitor’s OSD, which requires reaching up to use the buttons and navigation joystick tucked behind the right edge of the frame. Although the joystick makes using the OSD very intuitive, it doesn’t compare to the speed and ease of use that DisplayWidget brings to the Windows desktop. The main interface is populated with icons that activate each GameVisual mode. You can also select modes by right-clicking the DisplayWidget icon in the taskbar. In both cases, the transitions between modes are instantaneous. Fine tuning options for each mode are exposed through Advanced Settings, which serves up sliders for everything from brightness and contrast to RGB levels and pixel response. You can tweak the picture to suit your personal preferences or to compensate for the natural variance that occurs in LCD manufacturing. Advanced Settings even includes toggles for ECO mode, which reduces power consumption by 22% on the MG24UQ, and ASUS Smart Contrast Ratio, which dynamically adjusts to maximize darker scenes. After perfecting GameVisual profiles, you can save them as AXML files that are easily shared with other DisplayWidget users. While DisplayWidget makes it easier to change GameVisual modes, manual switching still requires a degree of mindfulness. App Sync puts the process on auto-pilot by intelligently changing modes based on your preferences. You assign specific modes to individual applications, and App Sync makes sure the monitor is in the right mode when those programs enter the foreground. A few minutes of setup is all it takes to ensure that your monitor always displays the best possible picture for whatever you’re doing. There’s more to DisplayWidget than its masterful control over picture profiles. The utility exposes control over the monitor’s blue light filter, which protects your vision by blocking up to 70% of harmful blue light emissions. Part of ASUS’ Eye Care portfolio, this technology can also make it easier to sleep after a late-night Netflix binge, gaming marathon, or term-paper crunch. The Image tab has shortcuts for rotating the picture to a portrait orientation that’s ideal for long documents. Like ASUS’ other MG-series monitors, the MG24UQ pivots to portrait on a fully adjustable stand with ample height, tilt, and swivel range. 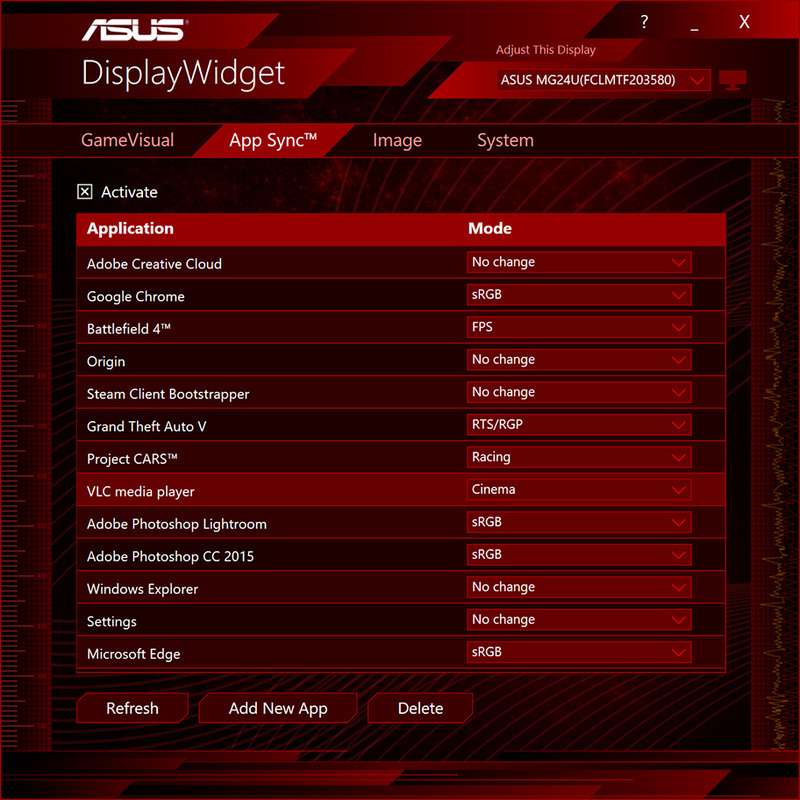 If you have an ASUS MG24UQ, MG28UQ, or MG248Q gaming monitor, you can download DisplayWidget and try it for yourself. Let us know what you think in the comments.